Electronics Mechanic Angela Miller, of Tobyhanna Army Depot, Penn., uses a Automated Common Equipment Station to test a multi-function display for a CH-47 Chinook helicopter Common Avionics Architecture System. With an eye to the future, Army aviation officials recently merged the talents of Tobyhanna Army Depot and Rockwell Collins to repair cutting-edge technology used on the CH-47F Chinook helicopter. 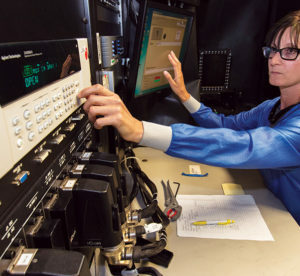 Technicians here will use test equipment and parts supplied by the original equipment manager, or OEM, to sustain the Common Avionics Architecture System, or CAAS. The CAAS-equipped aircraft provides Army aviation with a reliable and efficient heavy lift cargo helicopter for tactical and combat support mission requirements around the world. Tobyhanna was named the Depot Source of Repair for the CAAS equipment and works with Project Manager for Cargo Helicopters, or PM-Cargo, which executes the life cycle management for the world’s most advanced heavy lift rotary wing aircraft. Forging partnerships with industry is crucial to meeting the challenges of ensuring readiness and protecting critical capabilities within the industrial base, said Lt. Gen. Larry Wyche, deputy commanding general for the Army Materiel Command and senior commander of Redstone Arsenal. The CAAS is often referred to as a glass cockpit, which consists of touch-screen, multi-function flat-panel displays. It’s a switch from the older electronic architectures of the last 20 years, which are gauges and dials. The equipment features sophisticated real-time operating-system software and the latest in processor technology, which improves situational awareness. In addition to performing necessary repairs, eight employees, who work in the flight control and navigation section, will test the CAAS components using the automated common equipment station, or ACES. The team members completed a 40-hour training course and are anxious to get started. All the parts have arrived from the OEM and the systems are due any day. Electronics Mechanic Angela Miller said that the CAAS system looks and operates much like the dashboard of a car, especially the new ones with features such as onboard a Global Positioning System and Bluetooth. She also noted that the system hardware and software can be adapted to meet mission requirements of a broad spectrum of rotary wing aircraft. Bradley Statz, a CH-47F logistics manager at Redstone Arsenal, remarked that developing this partnership was a challenge, but it came together on time and within budget. Electronics Mechanic and member of the team Amanda Oziemblo agreed. Senior military leaders realize that as the Army transforms to a leaner, more lethal, agile and expeditionary force, partnerships with industry become more critical than ever. Tobyhanna is working to expand this partnership to support other CAAS-equipment aircraft across other military services. Tobyhanna Army Depot is a recognized leader in providing world-class logistics support for command, control, communications, computers, intelligence, surveillance and reconnaissance systems across the Department of Defense. Tobyhanna’s corporate philosophy, dedicated work force and electronics expertise ensure the depot is the Joint C4ISR provider of choice for all branches of the Armed Forces and industry partners. Tobyhanna’s unparalleled capabilities include full-spectrum logistics support for sustainment, overhaul and repair, fabrication and manufacturing, engineering design and development, systems integration, post production software support, technology insertion, modification, foreign military sales and global field support to the nation’s joint warfighters. About 3,100 personnel are employed at Tobyhanna, which is located in the Pocono Mountains of northeastern Pennsylvania. Tobyhanna Army Depot is part of the U.S. Army Communications-Electronics Command. Headquartered at Aberdeen Proving Ground, Md., the command’s mission is to research, develop, acquire, field and sustain communications, command, control computer, intelligence, electronic warfare and sensors capabilities for the Armed Forces.